I often find myself transcoding video into all sorts of different formats, and today I found myself needing to get a video into FLV format for streaming. While I usually just upload my H.264 MP4’s into a place like YouTube, occasionally I need a different format. I’ve tried all sorts of tools, including FFMPEGX and several online tools such as encoding.com, but I was never completely thrilled with the results. They always take a lot of fine-tuning and Ffmpegx, for example, always seemed to make my videos darker, which wasn’t good.Today, I tried out Adobe’s Media Encoder CS5.5 to take a QuickTime H.264 and get it into FLV. 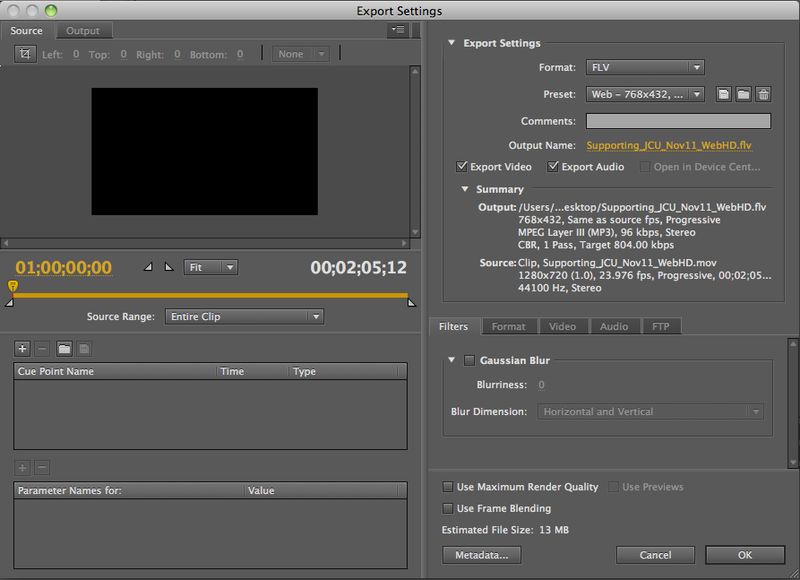 Media Encoder CS5.5 is really geared towards exporting right from Premiere, but it will take external inputs, which is what I did. I was pleasantly surprised by the experience – the process couldn’t have been simpler – I dragged in my file, selected a preset output and hit go. Seriously, that was it. After the render, I tried the same conversion again, this time changing the preset values and doing a second pass-through at the highest quality level. I was surprised at not only how fast the encode went*, but the file size was very reasonable for this file – which was originally 1280×720 high definition. I like the ease of use and the very large number of presets available in Media Encoder. If doing a simple transcode, it’s easy to get going yet you can also heavily customize the experience. 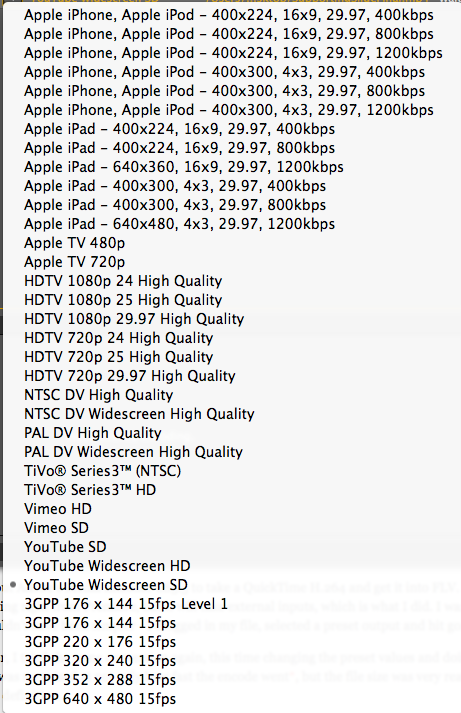 There are presets for video sharing services such as YouTube and Vimeo, which is nice. It will even take Photoshop files, image files, MP3’s and more. 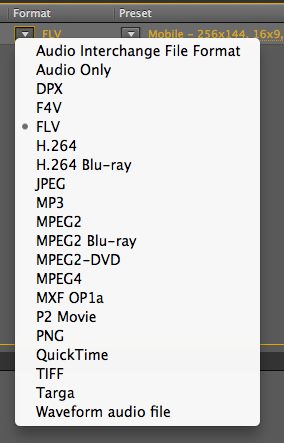 While I haven’t used it with Premiere, I like that you can bring in other file formats and set up a render queue. Setting up a set of renders for web, mobile, and TV usage is a breeze. Finally, I like that you can set up a watch folder and Media Encoder will start a pre-determined set of actions if a file appears. I could see this being useful if you, for example, had it watch a shared Dropbox folder and then spit out a mobile-friendly video back into that folder for your team. Adobe, if you’re listening, I had a few ideas in using this software. I like that you can have Media Encoder FTP a file to a destination once it’s complete, but it’d be very handy if you could also set Media Encoder to send a file to an Amazon S3 bucket. This would be a nice piece in a workflow if a video could be put in the cloud automatically upon render. Second, one thing I liked about Final Cut back in the day was the ability to set up a few computers using XGrid to distribute a render to a few different workstations. We’ve got a few machines sitting around that could potentially be used as a pseudo-render farm. It would take the load off my machine and make transcodes much faster. A double-pass, highest quality encode of a 3 minute HD video from H.264 to FLV still took 12 or 13 minutes on my pretty decently powered iMac. To split that off to a few machines would be nice, especially if I’m doing several sizes/flavors/versions of a particular video. 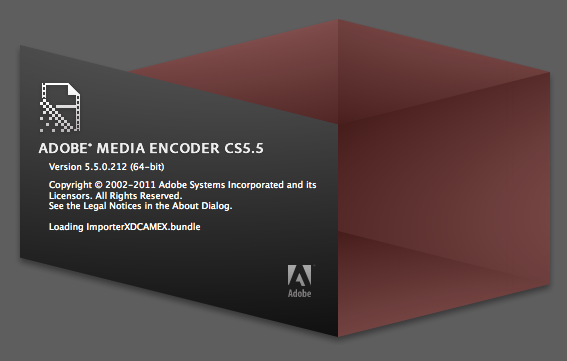 Adobe’s Media Encoder CS5.5 is simple to use and has lots of presets, yet you can customize it and it will work with video, audio, images and more. It is going to be a piece of software I see myself using quite a bit. Here are some screenshots from the app. Click on each one to see a larger version. * – to be fair, my iMac has 12GB of RAM. Disclosure: Adobe provided me a copy of Media Encoder to try. This did not influence my thoughts on the product or this review. No payment was accepted or offered for this review, nor was there an expectation of one.